-A paving Contractor will be applying seal-coat and re-striping parking spaces and pedestrian walkways on NW 1st Street and Olive. Work will be done in sections as indicated in the diagram below. 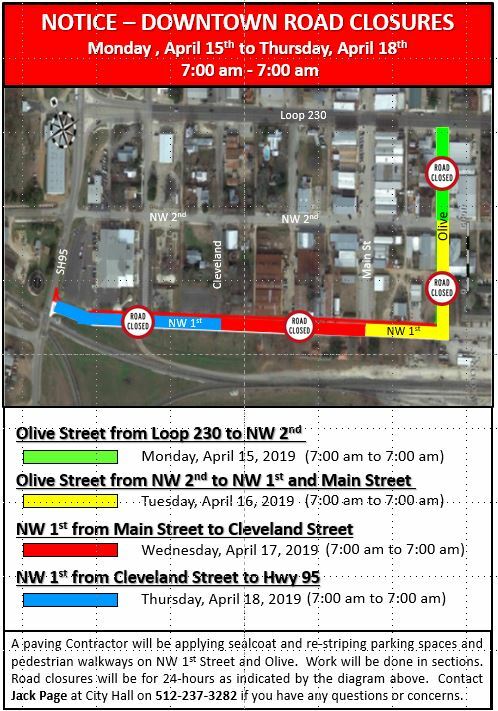 Road closures will be for 24-hours (7:00 am to 7:00 am). Contact Jack Page at City Hall on 512-237-3282 if you have any questions or concerns. We apologize for any inconvenience this may cause. Thank you in advance for your cooperation.